Are you looking for a Simple and Romantic Beach Ceremony that doesn’t break the bank? Want to have the peace of mind that all the basic details have been already taken care of before you arrive on the island? Do you want to have a locals expert opinion on the best the island has to offer for you and your guests for your wedding vacation AND not have to spend a ton of money? 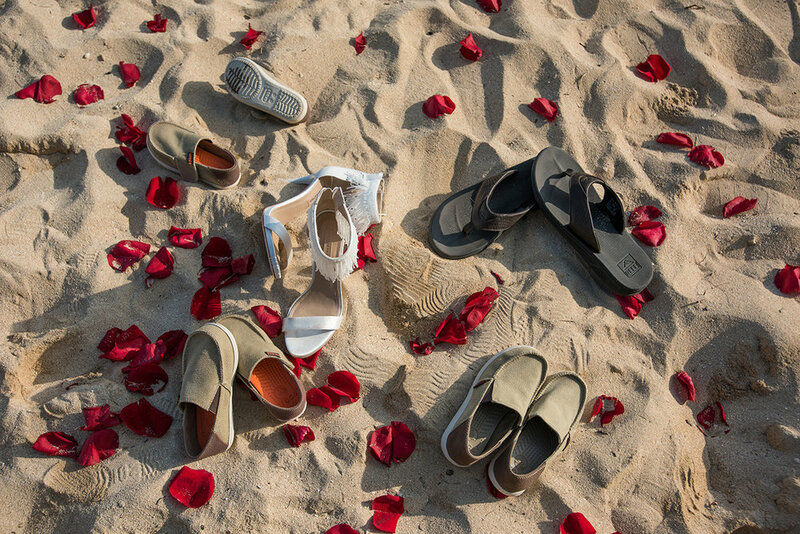 If you answered YES to these questions - Our SIMPLE HAWAI BEACH Wedding Package is for you. Our "Simple Hawaii Beach Wedding Package” is perfect for couples looking for an intimate (20 guests or less) and simple beach ceremony. The package includes everything you need - help finding the perfect beach location, an amazing photographer, a wedding officiant, and connections to the best vendors the island has to offer. You will have your own personal wedding planner that will help guide you through the planning process so that when you arrive in Hawaii you don't have to worry about a thing. A full outline of what is included is outlined below. If you feel like this might be exactly what you're looking for, please fill out the contact form for more info. and see if your wedding date is available. ✦ Assistance with finding the Perfect Ceremony Beach Location. Based on your vision, we will help you find the perfect beach for your wedding ceremony. How does this work? We ask you to describe your perfect beach & to tell us your wedding ideas and we will help you choose the perfect location. Do you prefer bright turquoise waters? Do you want to be barefoot on the sand? Do you prefer sandy or rocky beaches? Would you prefer little to no crowds? You tell us what you want and we'll help you pick the perfect beach location, sharing with you photos of each beach, parking descriptions, information on how far it is from the hotel area, etc. We will give you a detailed outline of what we feel our your "Top 3 Beach Options" and then you decide which you like best. We will secure the necessary legal permits and paperwork for you. ✦ Marriage License Processing. We will give you detailed instructions on where to get your license, what to do, process of filing, etc. ✦ Licensed Officiant / Minister. We will provide you with an officiant, someone who we trust and who we know you will like. We only recommend officiants we have worked with in the past who we feel will be a good fit to you. We put you in touch with the officiant directly so that you may personalize your ceremony with him. Do you want a Hawaiian Lei Ceremony, do you want to have a special reading, or personalized vows? Let us know how you would like the ceremony to go and we will find the perfect officiant for you. You will get to speak to the officiant on the phone ahead of time to get to know him/her and to personalize your ceremony. ✦ 1 Hour of Professional Wedding Photography. Editing included - Digital images on disc or emailed. Please note, this is a huge difference between our beach package and other companies - Most Beach Wedding Packages do not include a Professional Photographer, comparatively all of our photographers do photography for a living, and are wonderful. These photographers are excellent at their trade and we will send you their information ahead of time so that you may see their website and work. ✦ Hawaiian Keepsake Marriage Certificate. ✦ Fresh Hawaiian Floral Sprinkle of Isle. ✦ Two on-site Professional Wedding Coordinators. We always have two Professional Wedding Coordinators on site to help set-up, organize and clean-up the ceremony. ✦ Beach Ceremony Decor - Includes but not limited to hand-painted wooden signage that read, "Ceremony" and "Wedding" with arrow and "Best Day Ever". ✦ Natural Vine Aisle. We hand-pick natural Hawaiian vines, the morning of your wedding ceremony and lay them in the sand to create a "Natural Hawaiian Vine Aisle" for you. ✦ Detailed Timeline Creation. Your Professional Wedding Planner will put together a detailed timeline of your wedding day and send to you and all vendors so everyone is on the same page. This includes sunset times, high-tide times, hair & make-up times, etc. Having your day organized and taken care of will eliminate any stress and worry on your wedding day leaving you feeling relaxed knowing that we are handling and taking care of everything. ✦ We do not handle your reception dinner but do provide you with "Our Top 3 Dinner Suggestions". Suggestions are based on your specific needs. Luau recommendations may be substituted. ✦ A just-in-case Rain Plan. (although it is rare, there are occasional stormy days in Hawaii, we always have a back up plan/location for your ceremony just in case). ✦ Detailed directions from hotel to ceremony site, upon request. Travel arrangement options. ✦ Assistance with additional flower orders. This includes basic assistance with bouquet and boutonniere orders, and all additional lei orders. We will also pick up bouquets and flower leis for you. Does not include centerpiece, arch pieces or any large floral orders. ✦ Access to our "Preferred Vendor List" which makes it easy for you to book the best vendors on the island, including video, hair & make-up, cake, transportation, etc. ✦ Unlimited e-mail communication with a Professional Wedding Coordinator to help you organize details of your Hawaii Beach Ceremony. This means unlimited e-mail correspondence with us to help you figure out all your ceremony details. This Simple Beach Wedding Package is $2,400 and inclusive of everything listed above. NOTES* - Extra travel fees may apply to certain beach locations. On some occasions pikake flowers are not available, in which case, we will choose a beautiful alternative for you. Package price is "as is", discounts are not given for smaller versions of this package, or for less guests, because we have found that you will need help with most of these items at some point in the planning process. Everything above is included, this usually covers the basic needs of a beach ceremony, we are also here to help you with any misc. questions or concerns you may have about Hawaii or your wedding day. If there is a Hurricane or large storm that we cannot avoid, we will do our best to work with you to figure out the best alternative solution, this may mean moving the ceremony up in time, changing the location, and possibly changing the date. Although this is rare, and has in fact never to date occurred, we cannot help or stop large storms from passing through, but we will do our best to help create the best solution possible. Photo pkg. is with one of our chosen photographers, includes 1 hour of photography and approx. 30 edited photos. Option to add on additional time or edits for additional fees. Prices vary depending on photographer, we will get you upgrade options at discounted rates. We do not serve cake or champagne on the beach. We can connect you with an excellent cake company that will deliver a personalized wedding cake to your dinner location. Alcohol is not legally allowed on public beaches in Hawaii but can be consumed in the limo :) Officiant and Photographer are included in pkg. and matched to your specific needs, but who you get is dependent on who is available on your wedding day. We will do our best to get someone who will be a good fit for you. There is a 20 max guest count, no exceptions, due to new state laws. Please let us know if the Simple Beach Wedding Package is something that you would like to move forward with. Also, if you have not done so already, you may read our reviews on here - Yelp or The Knot.